All hikes except on the day of the December holiday party are from this location. We meet in the main parking lot. Follow Red Hill Road east, which becomes Van Schoick Road after the light. Continue on Van Schoick Road and turn right at the next lights onto Holland Road. The park entrance is on the right after about 0.5 miles. Follow South Laurel Avenue for 1.5 miles, and turn left at the lights into Holland Road. Bypass Freehold and go north on Halls Mill/Kozloski Road to Rte 537. Turn right (east) on Rte 537, and continue past Colts Neck High School. Turn left onto Rte 34 north. Follow Rte 34 for 5.25 miles, crossing Rte 520, and turn right on Roberts Road. Follow Roberts Road east for one mile, and turn left onto Longstreet Road. 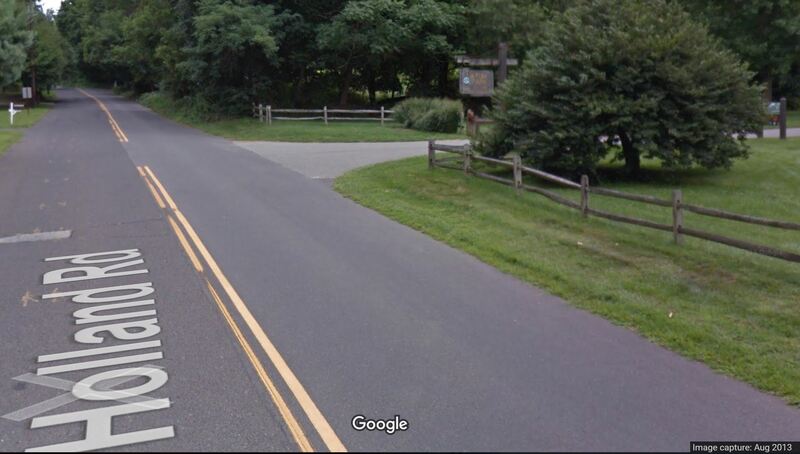 Pass by Holmdel Park and continue on Longstreet Road to the end. Turn right on Crawfords Corner Road, then make a quick left at the light onto South Holland Road. Pass under the Garden State Parkway, and at the stop sign turn right onto Holland Road. Follow Holland Road across the light at South Laurel Avenue/Van Schoick Road. The park entrance is on your right about 0.5 miles after crossing the lights.